Recently I facilitated a meeting of local officials here in Ann Arbor. They were members of the Local Development Finance Authority (LDFA) board, charged with oversight of the state funding to the Ann Arbor and Ypsilanti Smart Zone that spurs on high-tech business growth. This volunteer group operates openly as a local governing body, and as such, must run their meetings according to Robert’s Rules. As such, this group has a strict meeting format and structure and is open to the public. Can collaboration be achieved and trust built among members who meet infrequently in a structured and public environment? I was thrilled to be asked to help run a workshop for this group as they tackled such thorny issues as revisiting their purpose and goals and refining the roles and responsibilities of the LDFA and their biggest supplier, Spark. Bringing in an outside facilitator enabled every board member to participate equally without concerns of bias or prior knowledge affecting the discussion. Geting the group to come together on ideas and plans was a key goal of mine, and the chairman of the board. My plan was to start with a process to ensure everyone’s voice was heard. The LDFA has 9 official members and 3 ex-officio members. Anyone who’s worked with groups knows that the larger the group gets, the greater the impact of group dynamics – where quiet or more reserved folks tend not to share their thoughts as much as less reserved members. So while my intentions were to begin to pair members together to address issues (which has the additional benefit of increasing familiarity of the members and building trust), the public meeting rules requried that all discussions must take place in the open and heard by all. A modest adjustment to this model had every member write down their thoughts on 3×5 sticky notes and one-by-one share their written notes and ideas with the group. These notes were then posted on a flip chart on the wall – capturing all members ideas in one space. As each member shared their notes with the group, the group asked questions for clarification. This portion of the workshop went very well. Diverse and broad ideas were presented and shared with the group. These ideas were quickly consolidated by the board chair and a few members while the rest took a much needed break. 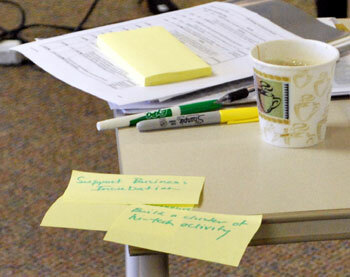 The remainder of the workshop benefitted from the openness of the first exercise. While the structure reverted to a more traditional board meeting – dialog among the members – the tone and nature of the dialog gradually moved away from strained to more collaborative. Thes discussions were focused back on the identified purposes, which worked to guide the group’s deliberations. By the end of the session, tough questions were asked and answered, building a foundation for increased trust among the board members. With the facilitated aid of a few structured exercises, meetings that are subject to the Roberts Rules structure and public scrutiny can be collaborative and engaging.